Men who work on their feet all day, and require a durable, protective work boot, often took to Timberland for their footwear. Timberland makes a work boot for nearly every situation and work environment. One of their most popular options is the Men’s Timberland Pro Boondock 6 Comp Toe Work Boots. Here is a detailed review of the Men’s Timberland Pro Boondock 6 Comp Toe Work Boots. We’ve included a list of specs, an overview of the boot, plus a few pros and cons. There is also a section listing comments from previous wearers of this Timberland boot. Timberland makes a variety of specialized work boots. While the diverse number of environments the Pro Boondock 6 Comp is good for, they’re a prevalent favorite of light construction workers. The boot has an added kick toe and heel plate to help protect the boot from getting scuffed up on dirtier jobs. They do not have a heavy layer of insulation, so they are great for warehouse jobs and other indoor settings that do not require heavy protection from cold weather. The exterior is tough and durable. Made with full-grain, waterproof leather, the Pro Boondock’s are built to last. The composite safety toe covers the full length of the toe, plus roughly two inches up the bridge of your foot. This toe meets all industry mandates for protective footwear. To help make this one of the most comfortable work boots in the Timberland line, they added an extra layer of shock absorption to the insole. Workers who have to spend long hours on their feet will appreciate this additional layer of cushioning. All Timberland work boots come with their 30-day comfort guarantee. If you don’t find your boot to be comfortable after 30-days, return it no questions asked. There is an extra layer of protection added across the outside of the composite toe. The rubber toe-cap is abrasion-resistant to keep your boots in good condition even in the toughest of conditions. 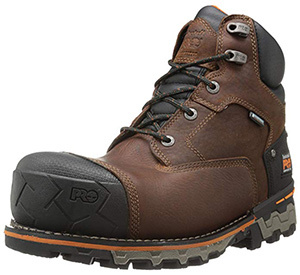 These boots are excellent for landscapers and all types of construction jobs. They are also excellent for electricians due to the synthetic sole that meets OSHA standards for protection. There is an external heel cup that helps provide a firm sense of lateral stability. This is excellent for individuals who want to feel more heel and ankle support. The synthetic sole is non-skid, non-marking, plus it meets industry standards for electrical safety. The Pro Boondock 6 Comp Toe Work Boot only comes in two color choices. You have the choice of a black full grain leather or brown distressed leather. So if you need a colored pair of boots, you should reconsider. This is a rather expensive boot choice as well, so workers and boot wearers on a budget may find the price a little high. While this boot is durable and offers tremendous protection, it is also heavier than many comparable work boots, so those who need lighter boots may want to skip them. This boot is full-grain waterproof leather. However, it also has a moisture-wicking inner lining that provides excellent insulation for cold weather conditions. The middle of the boot is durable leather, but Timberland has included full padding around the ankle collar. This is a very important feature for jobs that require lots of bending at the ankle. The Pro Boondock 6 Comp Toe meets the rigid standards for protective footwear established by the Occupation Safety and Health Administration (OSHA). This boot complies with industry standards for ASTM F2412-11 and F2413-11 safety standards that address compression and impact protection. There are three reinforced eyelets across the center of the boot, then a pair of flexible eyelets at the top. This helps you to better secure the boot, plus makes it easier to unlace and take off. Many boot wearers were familiar with what a steel toe boot was, but had no experience with a composite toe. Invariably, they were impressed by both the strength and comfort of the toe design used in the Men’s Timberland Pro Boondock 6 Comp Toe Work Boots. Owners mentioned they had previously worn the soles off their work boots faster than expected. They were pleased that Timberland puts a sole on the bottom of their boots, which is extremely durable. The full-grain leather also broke in without much discomfort. Adding protection to the heel and the toe was a valuable feature. The one disadvantage mentioned most prevalently was the weight. It took many owners some time to get used to wearing a heavier boot. To sum up the review for the Men’s Timberland Pro Boondock 6 Comp Toe Work Boots, this is a boot that meets a variety of safety regulations. It’s waterproof, insulated and durable. If you’ve owned a pair of the Men’s Timberland Pro Boondock 6 Comp Toe Work Boots, let us hear tell about your experience. In addition, if you found some things not mentioned in this review, share those with us as well.